Since there weren’t really any good places nearby to photograph sunrise, we slept in a little later on Tuesday morning. After a little breakfast we packed up camp and took the rough Jeep road to it’s end where we would start our hike. 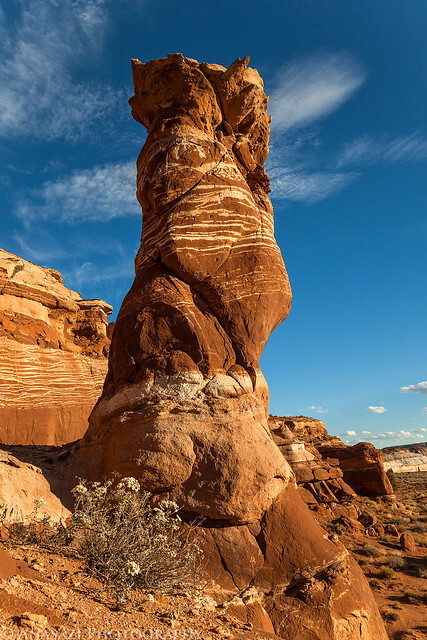 Our destination for today would be to the top of Flag Point in the Vermilion Cliffs of the Grand Staircase. Jared and I had wanted to try this hike last year, but were unable to squeeze it in. From what I understand, most people that have made this trek hike up from the base of the cliff and are able to find a way up, however we thought that we would try to hike from the backside. It was probably a longer hike, but it involved less steep climbing. 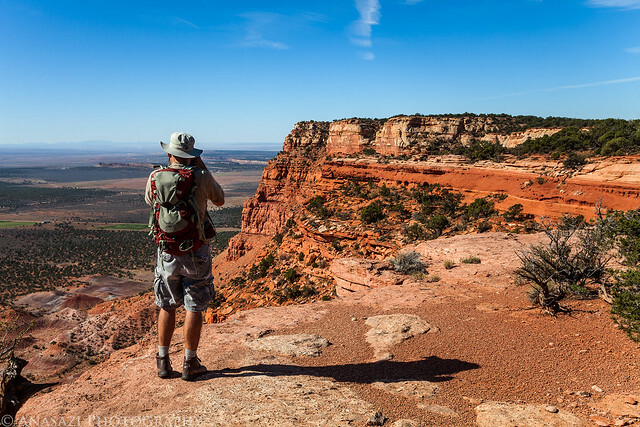 The view towards Kanab from the top of Flag Point. 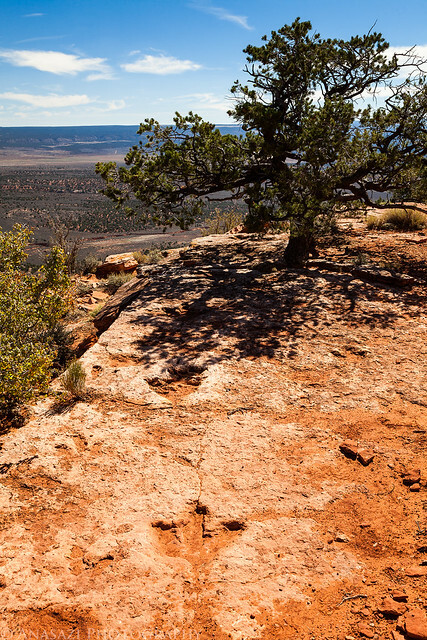 After visiting the point we started hiking along the rim in search of a dinosaur track site. Jared taking a photo looking back at Flag Point. 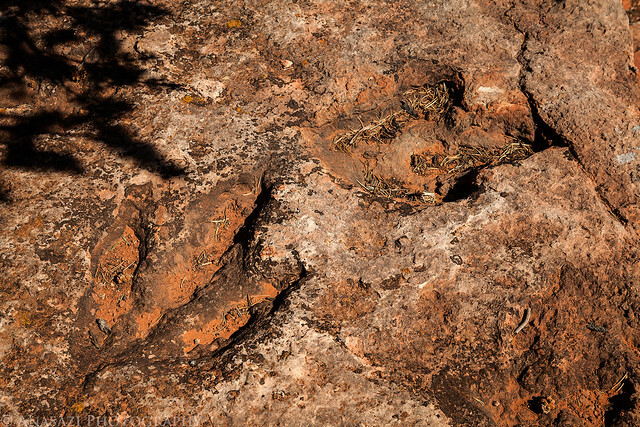 After hiking a bit and searching we eventually found the awesome dinosaur tracks. There are a few in this photo, but there were plenty more scattered around this area. Here’s two deep tracks that are located under the tree pictured above. After a little more searching nearby we found what I was really looking for on this hike. 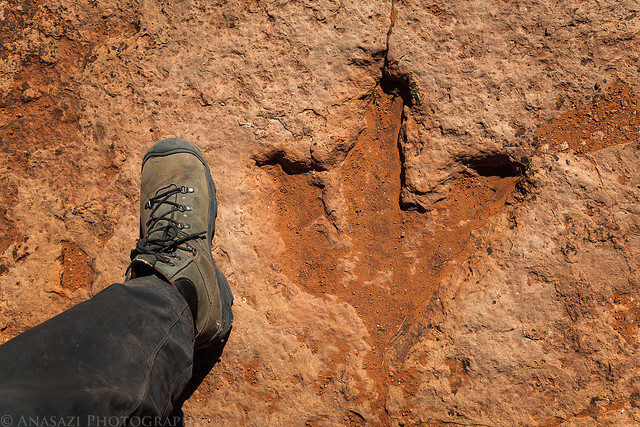 As far as I know, this may be the only pictograph depicting a dinosaur track! 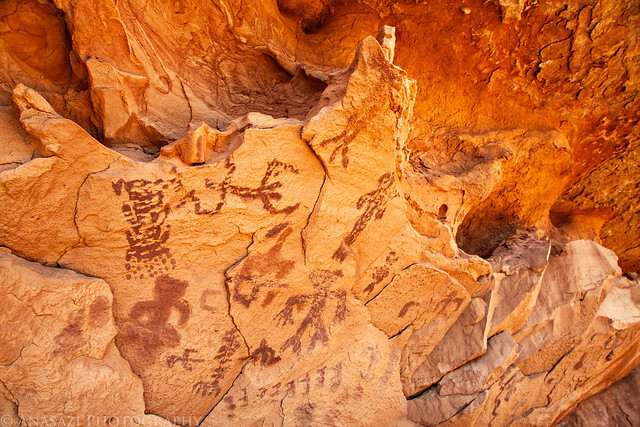 I wonder what kind of myths the Native Americans had about the tracks found at this site, especially since some of them appear to head right off the edge of a 1,000+ foot cliff? There were plenty of other ‘typical’ pictographs found here, too. 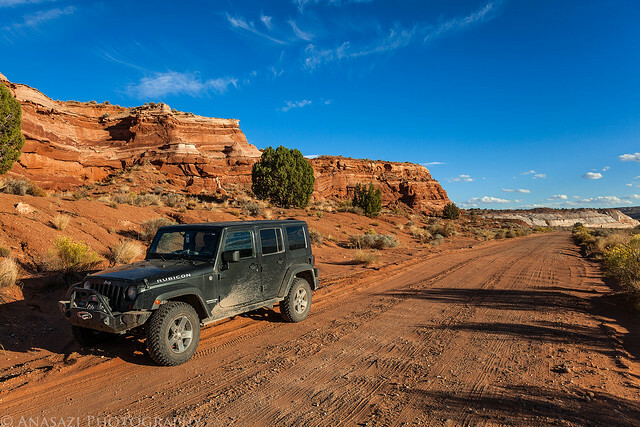 After exploring the area some more and taking plenty of photos, we hiked back to the Jeep and drove back to Kanab to grab some dinner before making our way back towards Lake Powell. 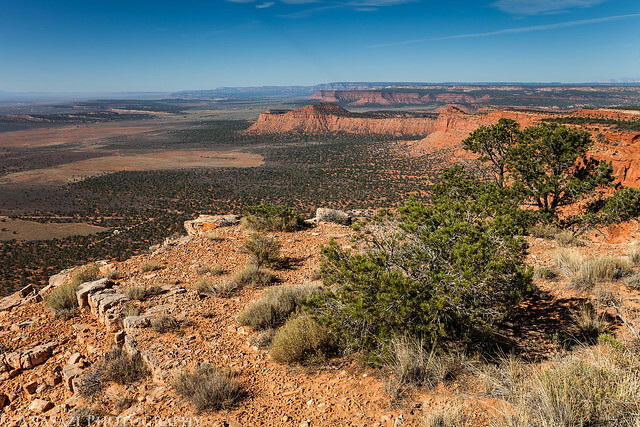 After leaving Kanab we took the short side road to the White House trailhead since neither of us had been down it before. 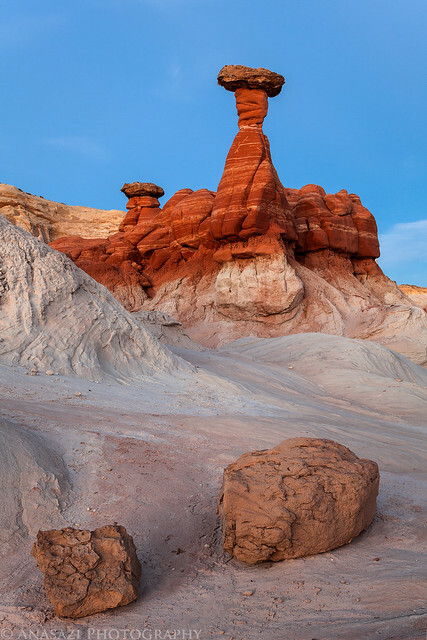 We spotted this hoodoo near the road and stopped for a photo. At this point it was getting pretty close to sunset, so we decided to head across the highway and quickly hike out to the Rimrock Toadstools. 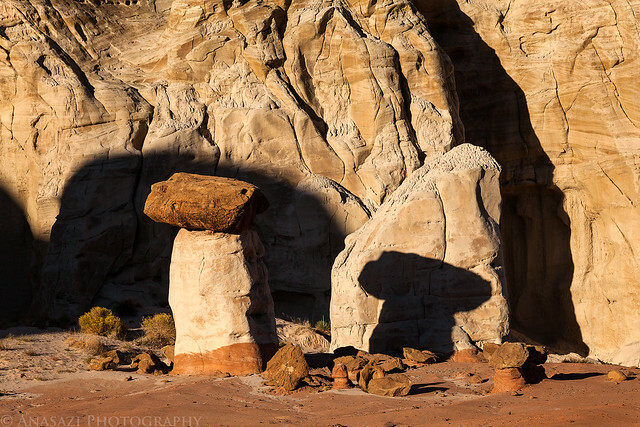 Here’s one of the smaller hoodoos casting it’s shadow on a boulder. 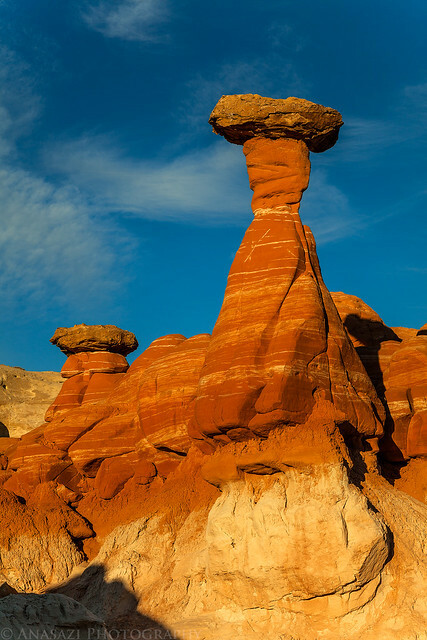 The biggest and most well-known toadstool found here immersed in warm afternoon light. 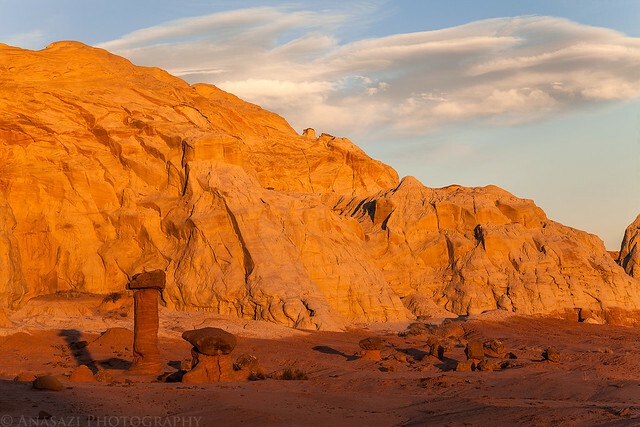 The rocks really lit up just before the sun went down. We stuck around after the sun was down and took a few photos in the twilight, which is becoming one of my favorite times to take photos. 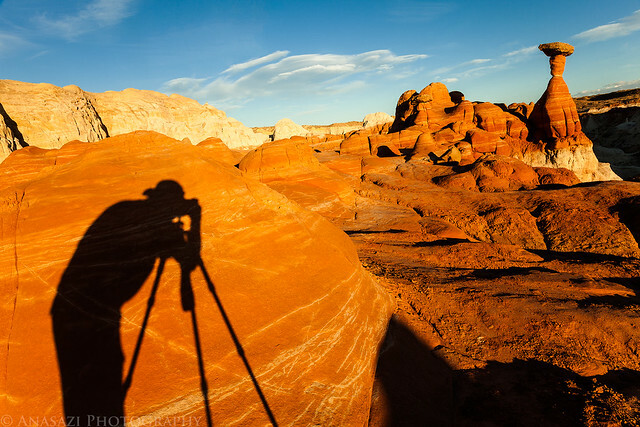 When the light was all gone we hiked back to the Jeep in the dark and started driving further east towards Lake Powell. We decided to camp out on Alstrom Point so that we could catch the sunrise there in the morning. When we reached the point, we quickly setup camp, took a few night photos (which didn’t turn out for me), and went to bed. It was a perfect night, so I setup my tentcot without the tent and slept under the stars. Here is the post i wrote about your awesome site! Very nice post Heather. I’m glad you enjoyed my photos enough to make a post about them them on your blog. Thanks! 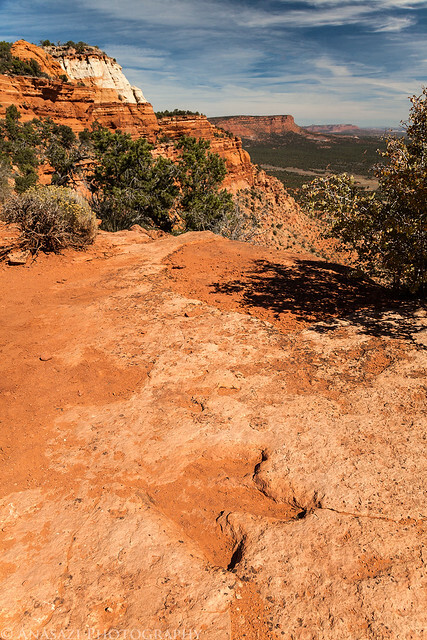 My wife and I have found similar tracks at Settlers Cove north of Kanab. 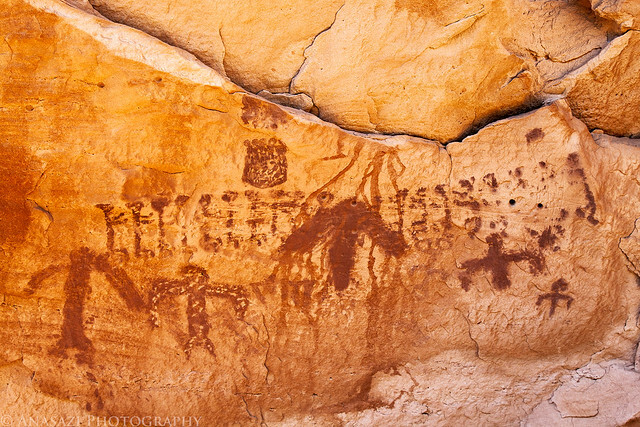 We would really like to see the tracks and petroglyphs at Flag Point but are not sure how to get there. We have been told that the trailhead is off of highway 89 on Seamans Road. Any additional information you can provide would be greatly appreciated. Fred, there is supposed to be a trail that climbs the cliff from Seamans Road, but I have no idea where it is located. I tried to find it once without success. 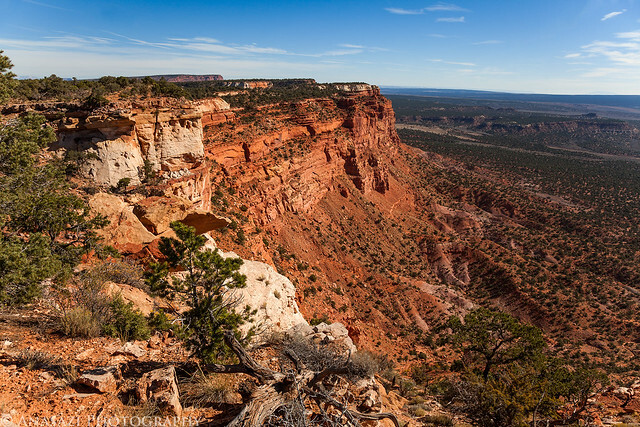 I ended up coming up the back of the mesa from a rough Jeep road. It was probably a longer hike, but less steep. Thanks for the response. We are going to try to get there this coming week.